Sessile Paguritta sp. 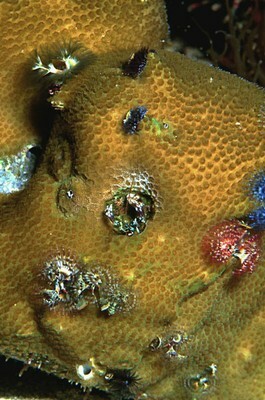 crab in Porites sp. 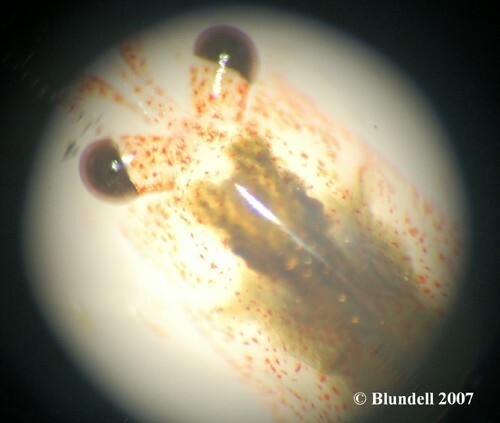 This photograph was taken of a sessile animal living in my 115-gallon aquarium. The subject is a sessile hermit crab (genus _ Paguritta_ ) which lives commensally with Porites and other massive corals such as _ Hydnophora_. I have observed these “critters” in the wild in Fiji at thirty foot water depths living in large heads of Porites at about one crab per square foot. The hermit crab feeds on plankton and particulate matter that it filters from the water using its modified antennae which is long and feathered, and can be seen in the photo.